Violent extremism is a perpetual alarming issue for a globalizing world. While much has changed in the years since the 9/11 attacks brought the issue to the forefront of global conversation, violent extremism remains salient in today’s world. Extremist groups rise from the ashes of other fallen extremist groups, leading to what appears to be an unending cycle of attacks, conflict, and carnage. Meanwhile, as globalization continues, movement of people, information, and ideas becomes easier, a development which, if employed maliciously, can be taken advantage of by opportunistic extremist groups. Indeed, as time has shown, the issue of violent extremism has been both complicated and pervasive. The ideologies behind such extremism have been able to stick, even in the face of a massive international response. As the world deals with the innovations globalization continues to provide, so too may violent extremists adapt and propagate their ideologies through new methods that can perpetuate their staying power. It is clear that the solutions that the international community has implemented throughout the post-9/11 Global War on Terrorism have been ineffective at comprehensively dealing with violent extremism. There are, though, other solutions. 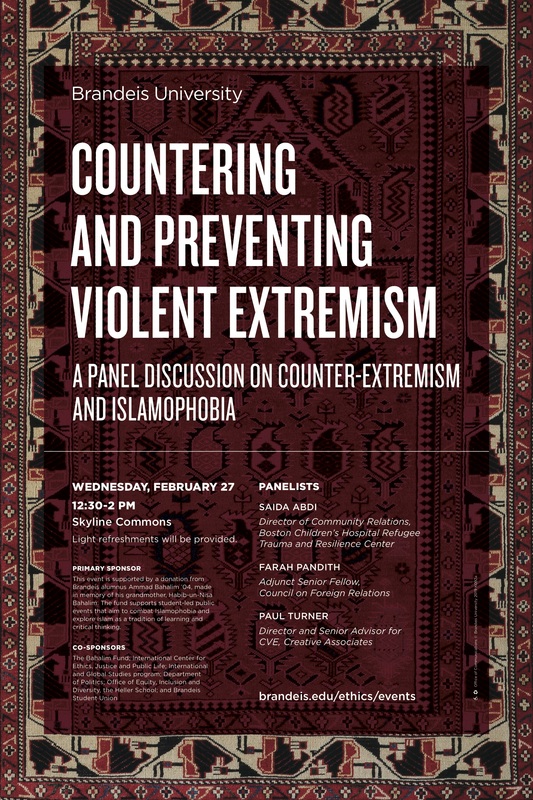 On Feb. 27, 2019, please join the Ethics Center, the Heller School for Social Policy, the International & Global Studies Program, the Politics Department, and the Bahalim Fund for a panel discussion on Countering & Preventing Violent Extremism, which will discuss recognizing the signs of radicalization and recruitment early in the process and how to address the issue of violent extremism at its roots. The panel will feature Farah Pandith, a former State Department official who has spearheaded Countering Violent Extremism (CVE) both inside and outside government settings. It will also feature Paul Turner, a leader in global conflict resolution, and Saidi Abdi, a leader in refugee support and the Associate Director for Community Relations at the Boston Children’s Hospital Refugee Trauma and Resilience Center. *NB: This event will be video recorded. People become vulnerable when they do not know where they belonged, especially now children at a very young age who are exposed to multiple cultures. And especially when people are lost, without an education to make them think independently, they tend to fall for the ideology that sounded appealing and powerful. Violent extremist organizations take advantages of these lost, vulnerable people. One of the approach to diminish this kind of ignorance is spread the education of the importance of different cultures working together to people at a very young age, hopefully, it will develop a sense of respect and understanding toward anything that is new to people. In this panel, all three speakers addressed the social impacts of extremism and what can be done to prevent people (especially the youth) from joining in. Apparently, they held different opinions on how to counter extremism on a global scale. From Pandith’s point of view, extremist groups are able to target and recruit young generations because the extremist ideology appeals to them at an emotional level, something that governmental structures are lack of. The ideologies of extremist groups often involved the definition of identity, or answers to “Who am I”. Extremists prey on these questions to lure people in. Moreover, she also criticized the U.S. government for putting little emphasis and little investment on counter-extremism; ideologies behind extremism events like 9/11 attacks should be treated like “global diseases” and human should fight it with the antibody. In order to do so, she addressed, “It can’t be solved the efforts of one sector”. CVE should be developed into a community-based system that motivates people to be aware of extremism and fight hate. Another speaker, Paul Turner stressed the importance of community cohesion as a general solution to worldwide extremism. He pointed out that society doesn’t need massive monetary investment for countering extremism; in fact, preventing the spread of radical ideology should be done at a micro-level. He further illustrated that sometimes people who join radical organizations are not driven by ideology; they may be propelled by economic reasons. Prevention should happen within communities at multiple aspects of people’s life (i.e. youth education & suicide prevention). Only by protecting what is good can fight what is bad. By establishing a bonded community can serve as a long-term solution to the worldwide extremism. Lastly, Abdi introduced another approach to containing extremism. To effectively address problems within the local communities, prevention should be conducted with regards to religion, culture and personal experiences. By tightly bonding with the local communities and developing interactive prevention programs, extremism can be solved more efficiently. I definitely agree with the panelists in the fact that the reason people become vulnerable these organizations is not being able to find a group they identify with in the society they currently live in. 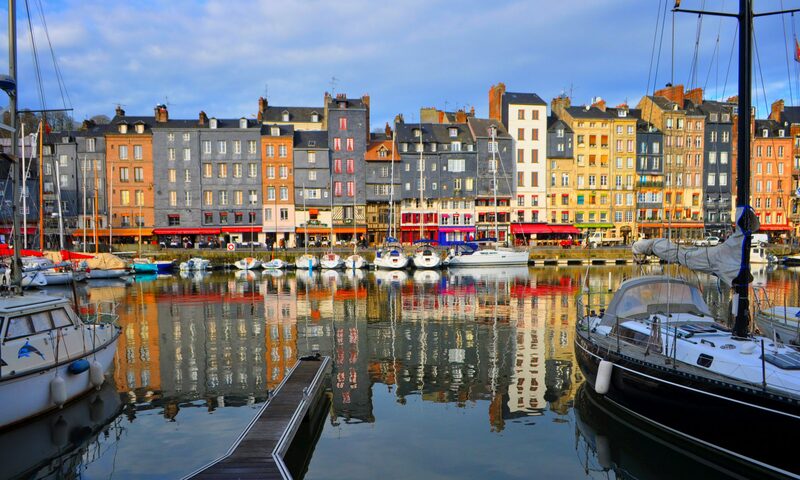 As human beings it is very important to us to feel like we belong somewhere, and that is not always easy to find, especially if you do not live in your native country. This “identity crisis” can be worsened if the other members of your society alienate you. This roots the feelings of bitterness and hatred, as well as the furthering one’s feeling of being lost. That makes it very easy for the extremist organisations to then take advantage of them, by giving them a place to belong. I think that a large part of the solution would be having groups that the vulnerable youth can identify with and belong to is very important. That would involve both having them more integrated in the society they live in and making their own communities more unified. Therefore, the youth would no longer feel alienated from society and would not yearn to join an extremist group that would fill their social need. Instead, this social need would be filled by various groups that the youth can identify and belong to. I think the most important reason for people, especially Muslim youths, to join violent extremist organizations is social marginalization. Muslim youths vulnerable to identity crisis and find themselves physically and mentally disconnected from the society. Especially in America, the us vs.them rhetoric makes Muslims youths believe that their religion is hated and Muslims are considered as the enemies. The belief that they would never be accepted as equal members in the society stimulates a lack of sense of belonging in Muslim youths’ hearts, which makes them vulnerable to the recruitment of violent extremist organizations. Many Muslim youths find the radical groups appealing because these organizations provide a sense of belonging to them and make them believe that they are valued and equal. In addition to the identity crisis felt by Muslim youths, radical propaganda and recruitment narratives also serve as important reasons of why people find violent extremist organizations appealing. Programs that aim at building a diverse, equal, tolerant, and strong community could help prevent people from joining violent extremist groups. As mentioned above, young people, especially Muslim youths, want to join violent extremist organizations due to social marginalization and a lack of sense of belonging. Therefore, programs that help connect young Muslims to their community or society would effectively integrate young people who suffer from identity crisis into their community. There should also be more programs which focus on Muslim youths’ mental well-being through helping them better understand their social and cultural identities and building up mental and emotional security in their hearts. People all desire a sense of belonging. In the past, this usually came from blood ties, local communities, and eventually nationalism. However as the world becomes more and more interconnected, we are experiencing a weakening of these connections. Violent extremist organizations target people who are experiencing these feelings by offering to give a sense of community. If we want to counter these efforts, we must find a way to offer a sense of community to vulnerable populations. If a peaceful and easy to access alternative to violent extremism is offered, I think people will naturally gravitate towards it. Of course, this is easier said than done, and a major roadblock towards the success of such a program is that it might be difficult to access those who feel disconnected. The rise of hate speech in the last couple of decades, the use of profiling by government agencies working to combat terrorism, and the entertainment industry’s choice to write dangerous characters as Muslim or Arab all contribute to the increasing marginalization of Muslims in this country. And when people feel marginalized, they become easier targets for radicalization. I think social programs that foster integration without targeting specific communities are crucial. These government initiatives would have to be implemented across the country, but at local and state levels because different areas of the country face different problems. Increasing diversity in youth programs will provide groups for all teens to identify with, while also increasing opportunities for educational moments that decrease ignorance and fear. One of the primary reasons, as was pointed out by the panelists during discussion behind the vulnerability of people being recruited by violent extremist organisations is social exclusion and marginalisation. When we as a society fail to assimilate people of different religions, races or identities, it makes the individual vulnerable to getting influenced by such organisations. The individual, in order to feel a sense of belonging, joins the extremist organisation. Many times, people belonging to religions like Islam are marginalised in their own countries because of the wrong social narratives present about them in the society. It prevents them from being a part of the community they are a part of and hence make them more receptive to different extremist organisations looking for impressionable minds. As pointed out by a panelist during the discussion, some people are motivated by their financial needs, if not ideologies. Something that can be useful in preventing the recruitment of the youth by the extremist organisations, as was pointed out by the panelist Saida Abdi, is the integration of the youth can only be done when people’s religious, cultural and personal problems are taken into account. Another prevention step, as pointed out by the panelist Paul Turner, can be the strengthening of the idea of what a community means. By making the youth feel a part of the community and by truly integrating them, we can prevent the youth from joining extremist organisations. While all three panelists discussed different aspects of the effort to counter violent extremism, it was the points on which they all agreed on that stood out to me. The first point that I noticed was that when asked if too many resources are being spent on CVE, they overwhelmingly said no, which is interesting considering the second point they all agreed on: that there are many problems with the way CVE is done today. They each mentioned in various ways the dangers of certain government programs in Europe and the US that vilify young Muslims and perpetuate the “us vs. them” narrative”. This disconnects these individuals from their communities and can encourage them to find acceptance from other groups. The fact that governments tend to lack emotion and the problem, by nature is an emotional one, is not conducive to government program driven success. Farah Pandith made a call for grassroots movements on a massive scale to target the billion young Muslims. Saidi Abdi supported this claim with the idea that young Muslims in the Middle East and North Africa who join extremist groups must be reached out to and welcomed by their communities. Although each of the panelists made obvious that in some ways CVE efforts have done more harm than good, it was also clear they believe in our ability to implement CVE responsibly. One common theme that all 3 panelists pointed out is the vulnerability of youth and youth questioning their identity. Terrorist groups prey on teenagers and give them an answer to this question of identity. Teens have been more vulnerable since 9/11 when the government started to segregate religous and ethnic communities more from the “American community”. This pushed young people in to becoming more interested in violent extremism. As Saida Abdi expertly explained, the best way to prevent young people from becoming radicalized is working within individual communities and adhearing to their needs. Abdi pointed out that strong social bonds are the best way to prevent radicalization and that the CVE program has ruined that. There is no one way of helping every comminity in the same way through the government, prevention has to be tailored to individual communities and seen as helping your child. Abdi also mentioned that working with religous leaders and paying careful attention to mental health has been effective. According to the panelists, one of the most important reasons that make people most vulnerable to being recruited by violent extremist organizations is social marginalization. I totally agree with this point. Because of social marginalization, it is hard for people, especially youths, to find out where they belong to. They lost the sense of identity, so they might be lured and instigated by violent extremist organizations. Also, panelists state that youths are easier to become the target of violent extremist organizations because young people are more emotional. By appealing to emotion, extremist organizations could recruit these naive, ignorant youths. Extremist groups usually give youths the answer to their identity questions, and at the instigation of these extremists, youths become more vulnerable to being recruited. What is more, the panelists points out that some people are recruited by violent extremist groups because of economic reasons but not ideological reasons. To my point of view, scarce education is also one reason that makes people vulnerable to being recruited by violent extremist organizations. The education here does not mean academic education that trains people to become engineers, lawyers, or doctors, but the education that teaches morality, social justice, and how to be a good citizen. If young people have these kinds of educations, they will have correct values and commitment to identity. They will be righteous, responsible, and empathetic. As a result, they will not be too naive to be instigated by extremist groups. Personally I think moral education can help reduce the risk that someone will be recruited. By popularizing moral education which contains teaching of morality, social justice, how to be a good citizen, and so on, people especially youths will have deeper understandings of their identities and will not be too ignorant to be recruited. What leaves teens vulnerable to extremist recruitment seems to be a question of identity and a need for a sense and purpose. Therefore the most effective way of preventing extremist recruitment is to create a nation of inclusiveness, and on a smaller scale create places where teens feel included, and give them a sense of purpose. These places would have to work with their individual community to incorporate religion and culture when necessary. These places would hopefully impact our national culture to be more inclusive and representative of the people who live here. People feeling excluded by society are subject to violent extremist organizations. Especially for the youth whose race, religion, and culture are different from the mainstream society, persuasive propaganda of the violent extremists would appear to be attractive and inclusive. For example, Muslim youth usually cannot feel a sense of belong in a bigger environment viewing them as minorities. They find themselves hard to identify with others. The appealing narratives of violent extremists can easily recruit these vulnerable young Muslims, through the platform provided by the development in modern digital technology. Nowadays, the ways in which information can spread far and wide to people from all around the world also speed up their accessibility to violent extremism propaganda, increasing the chances of them joining in violent extremist organizations. Programs aiming to help those feeling marginalized by their communities are worth the effort to reduce the likelihood people choose to join the violent extremist organizations. For the young people whose values are not yet firmly established and subject to external influences, it is important to offer them positive guidance such as proper education. CVE programs that address the need for those feeling alienated and truly care about their lives physically and mentally can be effective as well so that they will feel they are welcomed and bonded with their communities. According to the panelists, people are most vulnerable to being recruited to violent extremist organizations when they feel a sense of isolation or alienation from their culture. It seems to me that the most sensible solution to this was the one proposed by panelist Said Abdi from Boston Children’s Refugee Program. She was the only panelist who directly answered the question, has CVE made islamaphobia worse? Her answer was yes, of course it has. Thus, her solution was that CVE must go, and we must invest in community-based programs that do not simply enter communities, but actually are run by communities and draw solutions from communities. CVE cannot do this because it has already done too much damage; according to Abdi, it has “violated the things that are core to preventing radicalization”, that being “social bonds”. The other two panelists refused to directly answer the question, and rather blamed the media and “smartphone culture” for the proliferation of islamaphobia. While their points were not wrong–certainly Hollywood perpetuates a negative image of Muslim men and smartphones allow brief headlines to quickly spread fear–one cannot deny that the direct targeting of Muslim individuals by a government program like CVE, which has so much sway over citizens’ beliefs, has not only alienated Muslims in America but also reinforced fear of Muslims in America. Personally, I would like to condemn the proposals of Paul Turner, the director of CVE. I was unimpressed when he mentioned some of the Muslim populations he worked with questioning his positionality, and his response to that being that he “has worked with a lot of Muslims before” or “has Muslim friends”. He even described his seemingly sheltered upbringing in a “97% white” neighborhood. It is evident to me that he is not prepared to head an initiative that revives the much-needed social bonds, as articulated by Abdi, that are the ultimate preventative measure. Additionally, as Abdi mentioned, his proposed “blanket program” of CVE will not be effective in entering communities, which are each so individual and unique. Instead, a program must be tailored to and informed by each community it works with. Because of this, a large government program (i.e. CVE) cannot be truly effective and therefore should not be given such a disproportionate amount of funding and power. Instead of Countering Violent Extremism in Muslim communities, maybe we should be investing in Muslim communities, and poor communities of color in general. Perhaps we should be directing our “countering” efforts towards countering white supremacists and nazis. Previous PostPrevious Can the Diaspora Contribute to Africa’s Development?